Corporeally disparate but unified by conceptual threads, Aaron T Stephan's works—atomic to cosmic, hermetic to expansive—blow the minds of viewers. With materials and gestures that run the gamut from utilitarian to gorgeous, the creative endeavors of the artist are essentially united and inspired by the end points of representation and identity. Stephan walks us through some of the work displayed in Taken Out of Context on view at Whitney Art Works through June. 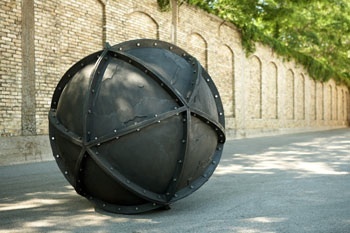 "In one corner of the gallery stands a six foot diameter cast iron world globe. This work, Flat World/Round Map reflects on an innovative mapping system developed by Buckminster Fuller. While Fuller's method of triangulation revolutionized the way we map, it is widely disregarded as an eccentric view of the world. Flat World/Round Map brings the Dymaxion Map into the round. The work explores the significance of Fuller's idea and its relevance to our understanding of the world around us. The other monumental work consists of a simple organized stack of classical Greek columns. This work speaks to notions of the individual within a community, the powerful influence of ancient Greek culture on our present-day western culture, and the relationship between structure and appearance. Through the negation of their original purpose, these columns present us with a re-interpretation of their iconic forms. Here, the functional and the decorative meet in a simple and graceful form. In the second gallery, The Burden Crates take form as standard wood packing crates that normally occupy the back rooms of galleries. The crate, an almost iconic form, often holds more intrigue for me than the work it contains. In this work one immediately recognizes that the crates take unusual form. They take shape as Chris Burden's iconic performance Shoot in which he had himself shot in the arm in front of an audience. This piece explores the original work while seeking its implications within the larger world - including the relationship between violence and art, ego and performance, and the body as vessel. A last set of works - situated throughout the gallery - speak to more iconic imagery from western art history. These tiny serial drawings portray iconic artworks. In some the dimensionality of the work is in question, in others - the hand of the artist. Here, repeated images and dissected forms bring to mind a careful exploration of what art history means to an individual art practice." An idea certainly familiar to Stephan, developed by Ludwig Wittgenstein, is that language is too crippled to express everything consciousness is capable of experiencing. Wittgenstein’s attempt to communicate this idea through the language of philosophy, in all its logical wordiness, is ironic. Later his writings are more cognizant of the very use and abuse of philosophy in processing the limits of thought and communication. Stephan's artistic process represents conscious efforts to illuminate what these limitations might entail in all aspects of life. In his work attempts at mapping the failures of representation and perception is fodder for making things. Stephan faces the shortcomings that plagued Wittgenstein inquisitively and thoughtfully. 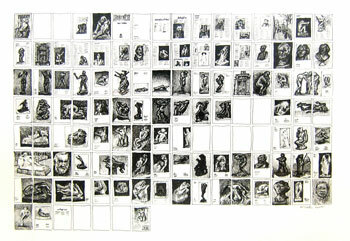 In a 2007 exhibition at Whitney Art Works The Problem with Ladders, Stephan showcased images of great thinkers like Wittgenstein collaged out of anatomy books. Stephan constructed the thinkers from pages cut from tomes of knowledge, dissecting works that dissected the human body. In another part of the installation,Building Houses/Hiding Under Rocks, many, many books exquisitely formed a small room. A celebration of the useless/precious –ness of books and ideas, Stephan let himself cherish relationships with books but also elevate their limitations to something sublime. The body, as the holder of knowledge, is as oblique as the word, conveyor of ideas. Likewise in works such as Flat World/Round Map Stephan melodizes Fuller’s faith that perfect geometry could create harmonious and Utopian correspondence with the world, again venerating the poetry of ideas but showing the limits of the literal. The essential importance of art and artists is ultimately the prerogative of art books and art institutions. 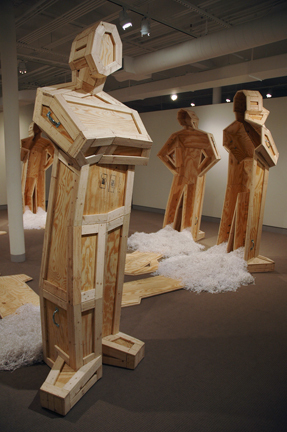 Stephan takes ‘em on by regarding the information in books as a map, and creating works of art like The Burden Crates that sympathize with how ideas are contained in ways that require unpacking. Exteriors and surfaces (such as art crates and printed pages) are earnest players, recreating art moments and ultimately failing. However this failure is only like the failure of language. Like the ear listening to a sentence without cerebral interference, transforming it into a musical cascade that echoes the fragments of archaic actions, these works divert knowledge into a genuine experience. What is not said, the phenomenon of two words looking good next to each other and evoking ulterior meanings--Stephan’s works are very bold in both form and in what they propose ultimately resulting in a personal meditation. Although as serious as any philosopher, Stephan also is a poet with a sensitivity that conveys transcendent joy. Aaron is a Portland resident who originally hails from Western New York. He made his home in Maine in 2000 to attend the graduate program at the Maine College of Art, where he graduated with an MFA in 2002. He was the recipient of the 2002 Marguerite Zorach fellowship to attend the Skowhegan School of Painting and Sculpture. He was the 2005 Louise Bourgeois fellow at YADDO in Saratoga Springs, NY in 2005, and was an artist in residence in the Arts/Industry Program in Kohler, WI in 2008. His work was featured in the 2003 Portland Museum of Art Biennial and the 2006 Center for Maine Contemporary Art Biennial. Other venues recently featuring his work include ICON Gallery, SPACE, the Institute of Contemporary Art at Maine College of Art, Hay Gallery, Filament Gallery, The Center for Maine Contemporary Art, The Nave Gallery in Boston, the DUMBO Center for the Arts in Brooklyn, NY, Northwestern Connecticut Community College Art Gallery, and Quint Contemporary Art in La Jolla, CA. Stephan has completed 5 public commissions to date including LIFT, a dramatic work that appears to be a twenty foot tall table and chairs, sited in the new Joel and Linda Abromson Community Center in Portland, Maine. He is currently working on a public commission for the city of Portland, ME titled BOOM.